Just weeks after the announcement that Batman: The Animated Series was remastered in high definition for the DC Universe streaming service, Warner Bros. Home Entertainment has announced that the long-running show is coming to Blu-ray in October. UPDATE: Pre-orders are live! The box set will be available with a trio of Funko POP mini-figures based on Batman, Harley Quinn, and The Joker. In addition to all 109 episodes of the series, it will also include a wide variety of bonus features and mini-documentaries, along with the animated feature films Batman: Mask of the Phantasm and Batman and Mister Freeze: Sub Zero. The suggested retail price is $112.99. The collectors Blu-ray box set will be individually numbered for a Limited Edition release of 30,000. More than 2,000 copies were pre-ordered within the first 24 hours of availability on Amazon. 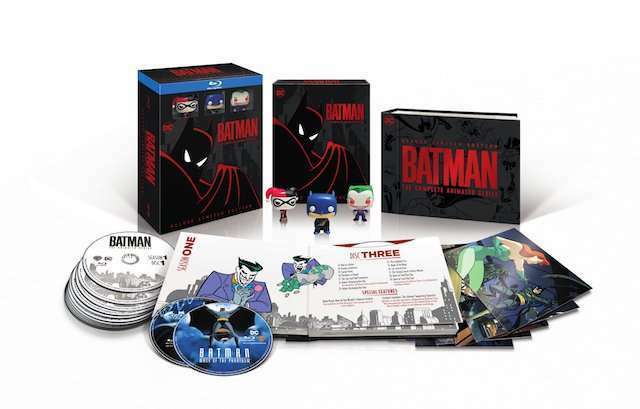 Batman: The Complete Animated Series Deluxe Limited Edition will hit the stands on October 16, 2018. You can see more on the epic collection's massive stockpile of special features below.